I love the new Soft Scrub Total Bath & Bowl and it is not just because I am a Soft Scrub Club Captain! Today it proved to me once again how wonderful it is. I really love this stuff! Today was just a half day at school and while we think that should mean a fun day… James says that it would be the perfect opportunity to clean. Who wants to clean on a half day? He is no fun! I hate cleaning and I have passed that hatred on to my children. One of the things I hate about cleaning is that you have to drag out tons of cleaning supplies and then put them all away again. Many times that takes longer than the actual cleaning. I have cleaning supplies everywhere. 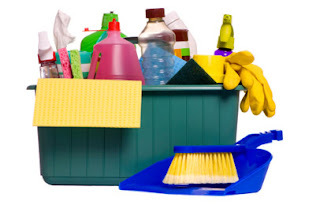 The cupboards under every sink are stuffed full of cleaners. We even have 3 shelves in the basement full of cleaners that can not fit in our cleaning cupboards. I have not even used half of the cleaners in ages because I do not like them. Between Soft Scrub Total Bath & Bowl and Soft Scrub Total Kitchen, I can now clean out those cupboards and free up some space. It also made cleaning super fast and easy. I am all for spending less time cleaning! Do people actually like to clean? They must have a sickness. 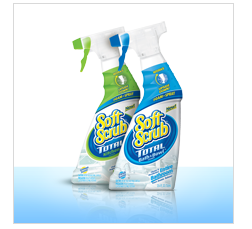 Soft Scrub Total Bath & Bowl takes the place of all of your cleaners and has two surprise design extras. I have never seen a bottle like this. The nozzle has a screen that opens and closes. When the screen is closed the spray becomes a thick foam. When you open the screen it becomes a regular spray. You may have noticed the strange shape of the bottle already. It is specially designed so you can spray it upside down. The angle of the bottle makes it easy to spray into any area. 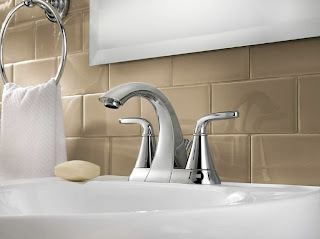 Now one bottle can reach and clean anything in the bathroom with a spray or foam. How convenient! I timed my cleaning today… 10 minutes to a clean bathroom! I quickly sprayed the foam under the rim of the toilet and then in the sink and on the handles of the faucet. While the foam went to work I changed it to spray and cleaned the mirror. I wondered if it could really do the mirror but it left a streak free shine. I then cleaned the wall around the sink and some spots in the shower that looked dirty with the spray. I went back to clean the counter and the sink that had the foam in it. Then it was time to tackle the toilet. I cleaned the seat and under the seat with spray and then scrubbed the foam in the toilet. That’s it… 1 spray bottle and 10 minutes later… the bathroom was clean. I did not even have to drag out a ton of cleaner. The bathroom even smelled clean and not full of chemicals. *As a Soft Scrub Club Captain I received my bottle free for review. My opinion is 100% my own and was not influenced. sounds good. I am going to have to give this a try because I hate cleaning bathrooms I will give anything a try. Great! I LOVE Scrubbing bubbles! They are always coming up with great, innovative products. Thanks for sharing. If you ever hear that they are looking for new captains just point 'em my way!